Our biometric solutions are used worldwide in operational critical areas. SDK's are available to software developers needing to create fast reliable biometric applications. When dealing with biometric data its vital that your company can meet the needs of emerging transfer standards, IDX BioSuite ensures that your companies biometric solutions instantly meets the ANSI/NIST-ITL 1-2000 and ANSI/NIST-ITL 1-2007 and ANSI/NIST-ITL 1-2011 specification, making your product capable of data impex with other biometric agencies worldwide including the FBI and Interpol. Supports the leading development environments. 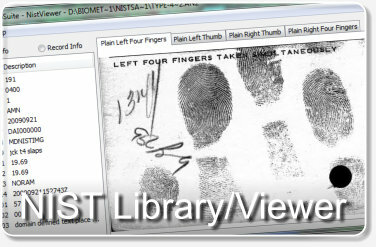 NIST Viewer is a free tool built using the NIST Impex Library, please visit the NIST Viewer page for more details.